Citation Information: J Clin Invest. 2007;117(3):587-589. https://doi.org/10.1172/JCI31423. Although it was first described in 1989, our understanding of coenzyme Q10 (CoQ10) deficiency is only now coming of age with the recent first description of the underlying molecular defects. The diverse clinical presentations, classifiable into four major syndromes, raise the question as to whether the deficiencies are primary or secondary. Recent studies, including the one by Mollet, Rötig, and colleagues reported in this issue of the JCI, document molecular defects in three of the nine genes required for CoQ10 biosynthesis, all of which are associated with early and severe clinical presentations (see the related article beginning on page 765). It is anticipated that defects in the other six genes will cause similar early-onset encephalomyopathies. Awareness of CoQ10 deficiency is important because individuals with primary or secondary variants may benefit from oral CoQ10 supplementation. CoQ10 is a vital component of the mitochondrial respiratory chain, where it shuttles electrons (e–) to complex III from complexes I and II. 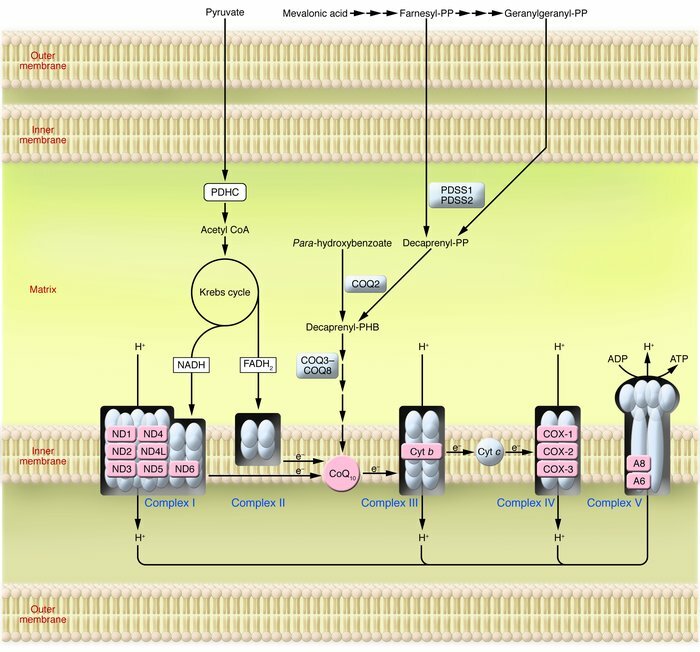 CoQ10 biosynthesis occurs mainly in mitochondria. Decaprenyl diphosphate is synthesized by a heterotetrameric enzyme composed of PDSSI and PDSS2 from mevalonate via farnesyl diphosphate and geranylgeranyl diphosphate and is attached to PHB by COQ2. Subsequently, at least 6 more COQ enzymes (COQ3–COQ8) catalyze methylation, decarboxylation, and hydroxylation reactions. A8, ATP synthase subunit 8; Cyt b, cytochrome b; FADH2, flavin adenine dinucleotide, reduced form; ND1–6, subunits 1–6 of NADH dehydrogenase; PP, diphosphate; PDHC, pyruvate dehydrogenase complex.